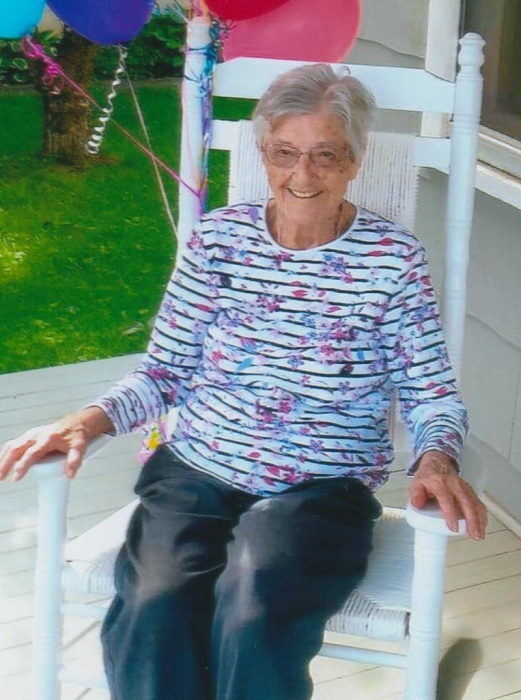 Myra Elizabeth (Smith) Vogelsong, age 100, of Mechanicsburg, passed away peacefully with her loving family by her side on Sunday, April 7, 2019. Myra was born on Friday, August 30, 1918 in Harrisburg to the late William Rugene Smith, Sr. and Myra Christianna (Atticks) Smith. Myra was the widow of Marlin Floyd Vogelsong, whom she married on March 16, 1941, and who died on May 25, 1956. In addition to her parents and husband, Myra is preceded in death by her three brothers: William R. Smith, Jr., Harvey W. Smith, and Paul S. Smith; her son-in-law, Harry "Red" Beers; and her daughter-in-law, Patricia E. Vogelsong. Myra’s survivors include her four children: Doris Beers of Palmyra, Harold Vogelsong and his wife, Vickie, of North Grafton, MA, Earl Vogelsong of Camp Hill, George Vogelsong of Mechanicsburg; her 12 grandchildren; her 17 great-grandchildren; her five great great-grandchildren; and several nieces and nephews. Myra worked for Stylco, a division of Kinney Shoe Corporation, in Mechanicsburg and General Pharmaceuticals in Shiremanstown for ten years. She loved to bake and was always making something, but Myra was best known for her sand tart cookies. Myra enjoyed playing Bingo, putting together jigsaw puzzles, watching The Lawrence Welk Show and game shows on TV, and working on her puzzle books. She also liked to knit and crochet, making afghans for many members of her family. Myra was a quiet and laidback woman who always looked forward to time with her family, especially her grandchildren, great-grandchildren, and great great-grandchildren. All are welcome to join Myra’s family at her viewing on Friday, April 12, 2019, from 11:00 a.m. until time of service at 12:00 p.m. at Myers - Buhrig Funeral Home and Crematory, 37 East Main Street, Mechanicsburg, PA 17055; with Celebrant George A. Spangler officiating. Burial will follow in Rolling Green Cemetery in Camp Hill. Honored to be pallbearers are: Randy Beers, Steve Beers, Chad Vogelsong, Joseph Vogelsong, Ryan Vogelsong, and Scott Vogelsong. Myra’s family invites everyone to join them for a time of food and fellowship at Hoss’s Steak & Sea House, 61 Gettysburg Pike, Mechanicsburg, PA 17055, following the burial. Contributions in celebration of Myra’s life can be made to the American Heart Association, P.O. Box 15120, Chicago, IL 60693, www.Heart.org/Donate. Myra’s family has entrusted her care to Myers – Buhrig Funeral Home and Crematory in Mechanicsburg, (717) 766-3421. Read Myra’s full obituary, view her memorial video and portrait, and sign her official guest book at Buhrig.com.